The new released Canon EOS 77D is Canon’s latest APS-C DSLR camera. It sits between Canon EOS 80D and Canon EOS Rebel T7i. The price of Canon EOS 77D is $899, $200 cheaper than EOS 80D, and $150 expensive than Rebel T7i. You can found great bundle deals of Canon 77D here. 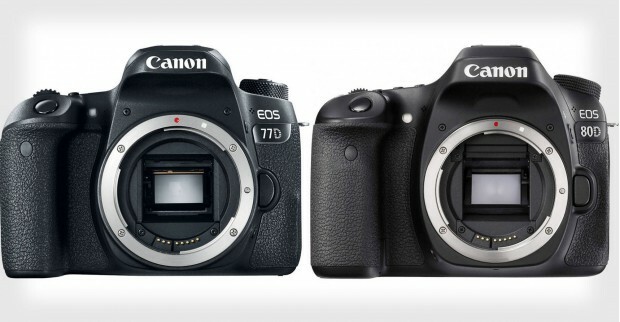 So which one to buy, Canon EOS 77D or Canon EOS 80D ? 1. Viewfinder: The 77D uses a pentamirror viewfinder while the 80D uses a pentaprism one. 2. Weatherproofing: The 80D is weathersealed while the 77D didn’t offer weathersealed feature. 3. Shutter speed: 77D has a max shutter speed of 1/4000s while 80D can do 1/8000s. 4. Shooting speed: 77D shoots up to 6fps, while the 80D can do 7fps. 5. Battery: 77D uses a lower capacity battery LP-E17 (1040mAh) than the 80D uses LP-E6N (1800mAh). 6. Flash sync: 77D has a max flash sync speed of 1/200s versus the 80D’s 1/250s. 8. Bluetooth: 77D has both Bluetooth and Wi-Fi while the 80D only has Wi-Fi. 9. Stabilization: 77D uses digital 5-way image stabilization, something the 80D lacks. 10. Headphone: The 77D lacks the headphone jack that the 80D has. 11. Size and weight: The 77D is both smaller and lighter than the 80D.